Our new summer program, Whitewater Academy, is an intensive four-day training for teens wanting to learn leadership and whitewater skills. In the heat of the summer, spend four days learning to paddle captain and row an oar boat. 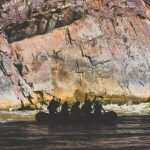 Finish with a bang in Westwater Canyon, some of the country's best whitewater, cutting through the black schist walls. CFI’s instructors, all certified whitewater guides, will coach students to navigate whitewater rivers, practice river reading skills, and learn how to row or paddle a raft. The curriculum includes basic river rescue, risk management and decision making, ethics for river travel, and swimming in the river’s milder sections. Cost per Person: $50 - Val A. Browning Foundation has generously provided financial support to help us greatly underwrite the true cost of the program. 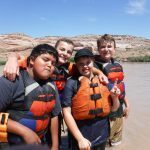 Learn to raft, paddle, and duckie the Colorado River this summer! 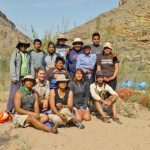 The Youth River Skills Camp is summer learning adventure for young adults entering 7th-9th grades. In the heat of the summer spend three awesome days paddling and rowing on the Colorado River. CFI’s experienced Naturalist Guides will teach kids to navigate rivers, starting out on calm water stretch and working up to some whitewater. Practice river reading skills, and learn how to row a raft or paddle a ducky, how to set up camp and be an awesome camp cook. This is a hands-on experience using paddle rafts and duckies. We'll cover basic river safety, river rescue, maneuvering different types of boats, ethics for river travel, and have fun swimming in the river’s milder sections! An exciting summer opportunity for kids entering the 5th through 7th grades! 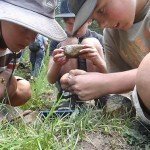 Our popular Explorers Base Camp is an exciting summer opportunity for kids entering 5th through 7th grades who want to be active, have fun and learn about our amazing backyard La Sal Mountains.